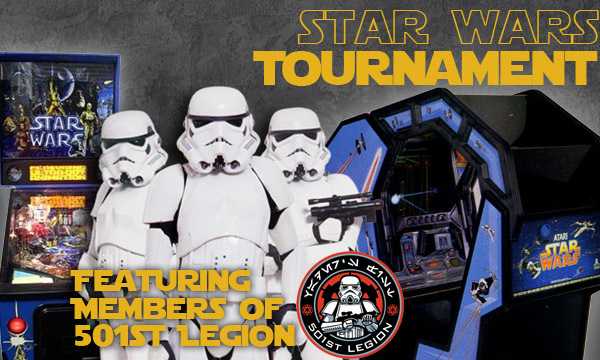 On Saturday, June 21, we will have high score contest for both the Star Wars pinball machine by Data East and the classic Atari arcade game. We are pleased to offer both a kids division (13 and under) and an adult division for both machines. We’ll have plenty of prizes to hand out to the top scorers along with trophies for the two adult winners and medals for the top three scoring kids in each category! If that isn’t enough, we’re proud to announce that we will have Star Wars Characters in full costume on hand for the the event! Thanks to Michael Rich from Atlanta Arcade Collectors, Art Sumner, and Patrick Wall for allowing us to use their machines for this special event. Qualifying: No fee to enter, play as many times as you like. We will form a line behind each machine. When you finish playing your game, you must move to the back of the line and let the next participant compete. Arcade participants, must start on the most advanced level. Pinball participants will play 3 balls with no extra balls or ball save enabled. If your score is high enough, it will be recorded until 5pm when the winners are announced and prizes awarded.